Status: offline hi... currently ingame one has to switch to height map in order to get an idea on the height and possible LOS of the units being deployed... which nullifies terrain features like forests or buildings... i propose that an overlay option be available where a semi transparent height map is overlayed over the terrain map... that ways one can see both the terrain and the height without having to cycle through the two.... thoughts? Status: online One thing I would recommend is to change the Hill Shader in the mapcolor.xml file to 1.5 or so. I think the slopes will be easier to see then. If you can find the right setting for you, you can eventually get where you can read the elevation without having to constantly look at the height map. Status: offline I'd like to know that too, to try it. 22 sec? hi... currently ingame one has to switch to height map in order to get an idea on the height and possible LOS of the units being deployed... which nullifies terrain features like forests or buildings... i propose that an overlay option be available where a semi transparent height map is overlayed over the terrain map... that ways one can see both the terrain and the height without having to cycle through the two.... thoughts? My thought is that what you suggest is alot of work! 15,000 sq/km of maps to redo contour lines, and in what spacing/scale (?) is more then I would want to tackle at this point as a dev. Maybe someone will want to do that as a mod if he/she has the time and will in the fuuture. That might be a faster and easier solution to do (as a dev) at least for now. We do see our OOB in the ISO view, so it´s just a matter of adding the "markers" to be seen. After all most modern trekking GPS can do that now days. Maps are used as back-ups and for light weight travel in most cases. Status: offline I think it is a good idea to make the colored height semi transparent. It is a pain to switch between the normal and height. It would be nice if the height colors were not starkly solid, but rather a slight overlay. its a simple semi transparent overlay of an already existing height map into an already existing terrain map.... how in the name of stalin`s mustache is that too much work? I do all of them. Well, what are you waiting for if it´s that easy? Then add it to the mod section. Iam also surprised to see that hitting a key is a pain? Oh, and my bad! I thought that what you wanted was contour lines in the HGT view, which make more sense then what your asking. Status: offline Looking at gbem's complaints, I was thinking exactly the same thing. I am not sure why he even plays it. Its seems he thinks its broken. Status: offline Yes, something like that is a good idea. Perhaps it could be tweaked a bit less or more transparent or with less saturation. It is a hassle to click it on and lose all the trees and details. Status: offline I don't see this as extremely useful though. Then whats the use of having three map views!!!! Iam not the one whos looking for options here! If you don´t want thoughts, then don´t ask! In other words, you want everything in one view, which defeats the purpose of having three different map views. I havent lost anything, your just want ppl to agree with you, NOT WHAT THEY THINK! So calme down, and show some respect! I don't see this as extremely useful though. Yes, something like that is a good idea. Perhaps it could be tweaked a bit less or more transparent or with less saturation. It is a hassle to click it on and lose all the trees and details. Looking at gbem's complaints, I was thinking exactly the same thing. 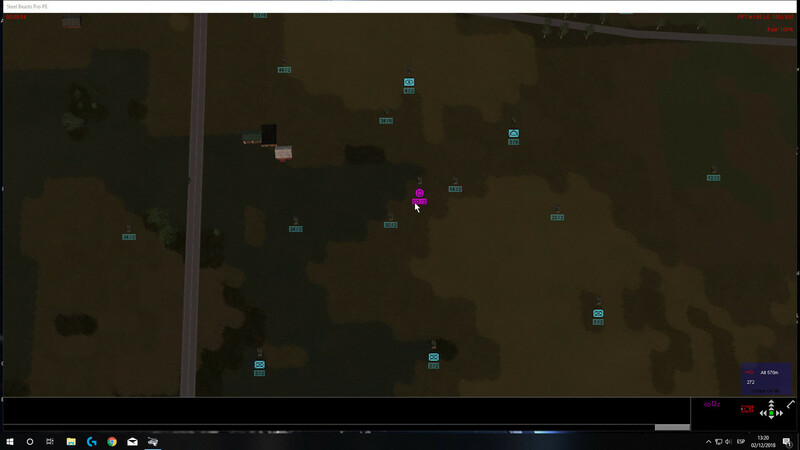 look mate im not saying anything is broken... i just want the OPTION to have a new map view added to allow people like me to eyeball LOS without having to switch between 2 mapmodes... would it kill you to give us the option to have another mapmode to those of us who wish to eyeball LOS? because you stated i want a steel beasts clone based on a simple request to have an extra map option... thats a bit of a wild conclusion dont you think? Status: offline I actually think that map looks very useful. My primary issue when playing Armored Brigade is figuring out elevation and line of sight. This is not unique to AB, and it's a significant interface issue for any wargame presented in 2D. As things are now, I'm constantly pressing H to check the height map. I also have to press L again to get the LOS tool back. My fingers are always on these two keys because I want to be able to understand the terrain thoroughly. To do that most easily, I need to be able to see both elevation and terrain detail at the same time. The map you've posted very easily allows me to understand the terrain around Gersfeld. I will still need to use the line of sight tool to confirm my estimations, but I won't have to alternately mash H and L to find good positions for observation and defense, or possible routes for attack that I may want to take or plan artillery on. It becomes particularly tedious because I have to fiddle with whatever I'm doing (like setting a waypoint), checking the height map, and using the line of sight tool. I accept that AB is a 2D wargame--one I very much enjoy--but a lot of a my less-fun time with the game comes down to building my awareness of the terrain. I would welcome any improvements to usability in that area. I said it "seems" like you want a SB clone, which isn´t saying anything bad of you, SB or AB. But you think otherwise! After all, they have admitted that AB feeds from other games like SB among others. If everytime someone mentions these games of that AB has feed from you are going to call them "trolls" or that they have lost something, then there´s not much to say to you. AGAIN, you asked for others thoughts! Whats a "wild conclusion" is saying like you have done about SB and AB what is wrong, be it data or what YOU think it should be or be added. Give your Ideas and be done. There´s no need to have 3-4 pages of your point of views on every thread you come up with. Veitikka has come up with this game, and it´s HIS child. If you don´t like it as it is, then play something else, or play it but live with whats there and/or wait for better things to come. Sure we can all give our feedback, but pushing it is not going anywhere, and it´s not the first time someone wants a "clone" of another game he/she has played but is tierd of and just dosen´t make up it´s mind on what to play. I much very like how AB is, and sure I would like "some" little things worked on or changed, but I also respect what the devs have decided on. Iam not going to "insit" on having it may way. Now your asking for a "third button", but then say it´s a hassel to be switching between views so everyone is happy? Really? Maybe we need a new setting in the mapcolors.xml allowing the player to set the opacity, like now how we can set the strength of the hillshade. eSim should contract you, hell even Veitikka should contract you! Your God sent to the community in every way, you know more then any of them! Armys should not be buying from eSim, they should buy direct from you. "FACEPALM"
Simple, as long as you have your way (now four view options), then your happy and we can all carry on! now if you say "SB also features a terrain overlay option therefore its a clone" then every game with a gun is a clone of GTA san andreas... or every game with an armor penetration system a clone of steel beasts... or every game with a human being in it a clone of sims... do you see how flawed your logic is? Status: offline Oh excuse me I should have said "similar" instead of clone, which would have received a "similar" reaction from you. Immature is saying your data/info resource is better then what eSim (and any other) has and of which world armies buy and exchange since eSim sold them there sim platforms. Now this has alot of logic to me, the same way that I rather have the ability to check my LOS in the ISO view, as well as being able to add a marker in the ISO view because tacticaly I can benefit from a 3D map view better then from a overlay on a exsisting map. But do you see me pushing this and/or making a big deal of a simple statment? NO!